If you are interested in participating in this voluntary program, please contact your Hines Property Management Office. What type of office lighting is used in your workspace? Does your office have occupancy lighting sensors? What settings are your computer and printer on? Do you work on ENERGY STAR-qualified electronics? How can you adjust your blinds to work with natural solar conditions? Does your office use human friendly paints, adhesives, sealants and carpeting? Does your employer sponsor any sustainability-related community engagement projects on annual basis? Does your employer communicate sustainability-related initiatives to employees on a regular basis? Do you use alternative transportation like bicycles, vanpools or trains? Do you track your own business travel and the related cost and emissions? Do you use virtual meeting technology for conferences? What kind of office paper do you use for printing? Is it made from recycled materials or responsibly harvested forests? Do you use disposable cups or reusable glasses and mugs? Do you have recycling bins at your desk? Do your restroom facilities use low-flow flush valves and aerators? Are your cleaning products harmful to breath? Do your cleaning materials contain post-consumer content? Are they made with bleaches and dyes? Are they certified by a third-party like Environmental Choice? Click here to learn more about green cleaning. Are you remodeling your office space? How many partitions are designed into the space? How much natural daylight reaches the building core? Are your workspaces modular and movable? Do your paints and carpets contain low levels of volatile organic compounds? Plastic bags, plastic wrap: You can now recycle clean plastic bags. Collect bags inside a plastic bag and put in your blue recycling bin. This includes bubble wrap, plastic wrap, newspaper bags, air pillow packaging (deflated), produce bags, bread bags, sandwich bags and plastic overwrap (all should be clean and put in to a plastic bag) Paper coffee cups: Put cup, sleeve, and plastic lid in blue bin. Make sure cup is empty of liquid before recycling. Soy milk or soup cartons: Cartons (aseptic containers) now go in the blue bin. Make sure carton is empty of liquid before recycling. Fabric: Put clean fabric in a clear bag, then in blue bin. Rips, holes, single socks okay. No shoes or belts. Milk cartons, juice cartons, paper soup cups, ice cream containers (waxy paper): Paper cartons now go in the blue bin. Empty contents. Lids okay too. Paper cups: Empty contents. Recycle paper cups and sleeves. Newspapers, magazines. Cereal boxes: Remove plastic lining (if any) and put lining into a plastic bag with other plastic bags and into blue bin. Junk mail, phone books: Glossy paper okay. Paper bags: Clean, not greasy or food-stained. Egg cartons: Paper and plastic egg cartons okay. No polystyrene foam. Packing paper, craft paper. Envelopes: Envelopes with plastic okay. Shredded paper: Place in sealed paper bag, label “shredded paper.” Sticky notes. Cardboard: Break down boxes. Clean Pizza Boxes & Cardboard food packaging: Greasy pizza boxes go in green bin. Cardboard Tubes. Aluminum cans: Empty contents. Aluminum foil: clean, no food. Make foil into a ball. Aluminum containers & trays. Cans, all metals: empty contents. Paint cans: must be empty, dry. If wet paint still inside - hazardous waste. Spray cans & bottles: empty contents. Bottle caps. Jar lids. Plastic bottles: empty contents. Plastic containers (all kinds): empty contents. Put items labeled "compostable" in green bin. Plastic cups, plates: No polystyrene foam. If labeled "compostable" put in green bin. Plastic coffee cup lids. Pens: separate parts of the pen and recycle. Plastic clamshells and other food containers: empty contents. Plastic tubs & lids: empty contents. Plastic toys: plastic only. No mixed materials, electronics, metal or batteries. CDs/DVDs. Plastic buckets: wire handle okay. All glass jars & bottles: clean and empty. All kitchen preparation and food trimmings, plate scrapings, meat, bones, fish, dairy products, baked goods, coffee grounds, filters, soiled paper products, paper cups, and paper plates, waxed cardboard boxes and milk cartons, floral waste and landscaping trim, food service ware labeled "Compostable" or showing the BPI logo. Plastic bags, plastic (saran) wrap, juice boxes, ceramic dishes or cups, coat hangers, plastic straws, bubble wrap, potato chip bags, styrofoam packaging, to-go coffee lids, and used aluminum foil. Many take-out food containers are recyclable or compostable now; just empty any remaining food in the compost bin or trash first. A good strategy is to have a blue recycling bin, green composting bin and a trash bin side by side in your kitchen. Most Californians don't know that it's illegal to discard any hazardous waste in the trash or down the drain, including products like fluorescent lights, unused medicines, pesticides, printer and toner cartridges, and batteries. These products contain toxic chemicals and heavy metals that can leach into the soil around the landfill or into groundwater. They have a complete list of retailers who recycle dry cell batteries, and for locations to drop off auto batteries, fluorescent tubes, paint, and other hazardous materials. Frequently asked questions about recycling in San Francisco. 101 California partners with Green Citizen www.greencitizen.com for free suite-to-suite pick-up of larger electronic waste items* (i.e. computers, TV’s, appliances, etc.). Green Citizen visits 101 California every 2nd and 4th Tuesday of the month for scheduled pick-ups. To schedule a pick-up directly from your suite, email pickup@greencitizen.com or call 415.287.0000 x 102 with a specific list of items to be recycled. If any tenant has a request for an immediate pick-up from their space, they may mark the items for removal and contact the Property Management Office at 415.398.8655. 101 California also offers tenants with smaller electronic waste the convenience of an e-recycling drop box on Lower Level Two (LL2). 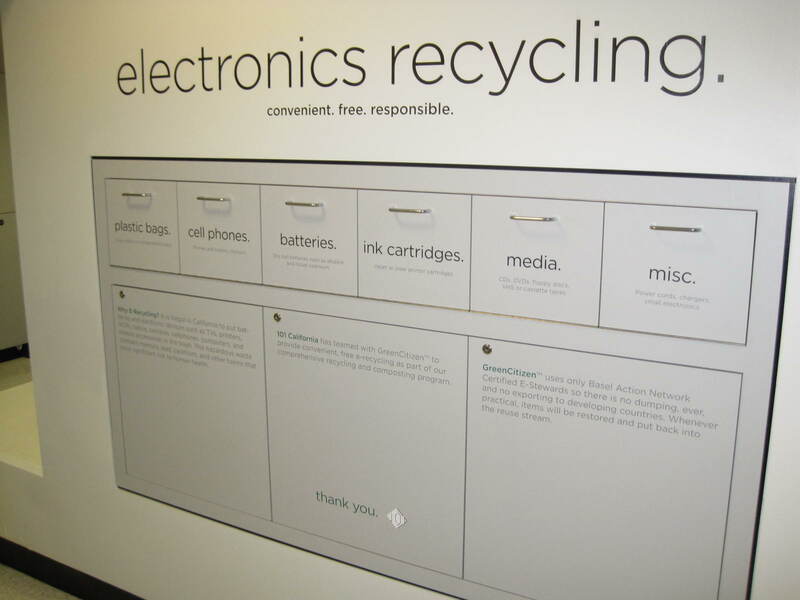 Smaller electronic waste, such as CD’s, inkjet cartridges, cell phones/chargers, batteries, plastic bags, and small misc. electronics/cords can be deposited in to the labeled drop box slots. On LL2, it is located near the mailboxes. We hope these services help eliminate electronics from entering the building waste stream, as it is illegal to send hazardous waste to the landfill. We encourage tenants take advantage of this free service by bringing in portable electronic waste from home. For more information on Green Citizen, Inc. and their rigorous adherence to sustainable and socially-just electronics recycling, please go to www.greencitizen.com. Batteries, CD’s, inkjet cartridges, etc. The e-recycling drop box is on Lower Level 2 (LL2) for smaller electronic waste, specifically CD’s, inkjet cartridges, cell phones/chargers, batteries, plastic bags, and small misc. electronics/cords. On LL2, it is located near the mailboxes. 101 California has partnered with Recycle for Change, a nonprofit organization, to provide a free and convenient way for tenants to recycle surplus clothing and other small household items. Proceeds from the donated items support volunteers who take part in sustainable development work in Africa, Central and South America. To learn more, please visit: www.recycleforchange.org. 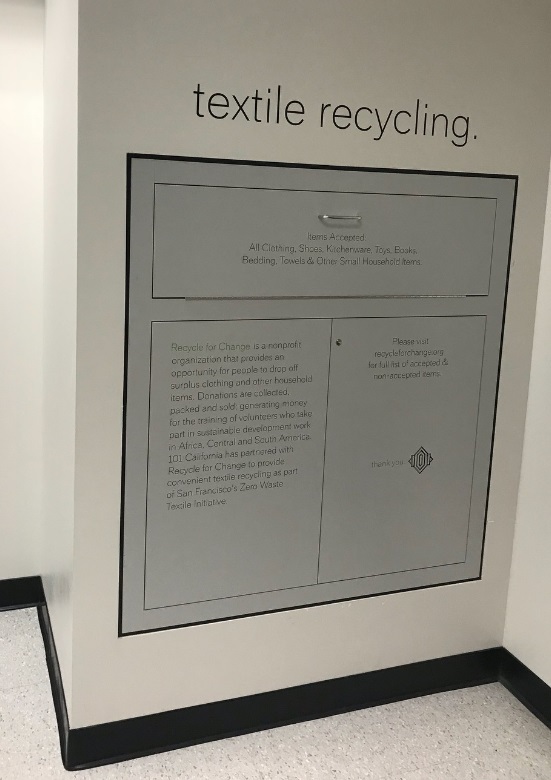 The textile recycling drop box is located on Lower Level Two (LL2) near the mailboxes and e-recycling drop box. Clothing: all types of clothing for adults, children, and babies. Shoes: all types for adults, children and babies. Handbags, backpacks, suitcases and other accessories. Please contact Property Management if items do not fit in drop box. Miscellaneous: Jewelry, toys, games, tools, curtains, bedding, towels, books, movies, picture frames, sports & camping equipment, etc.